Fox Hill Farm, home of Miracle Welsh, is a family farm situated on the northern border of Wisconsin. We are surrounded by the beautiful Nicolet National Forest, and very close to picturesque North Twin Lake. Our farm was established in 1919 as a dairy farm, and remained so for nearly 60 years. Since our purchase of the farm, we have been renovating and restoring the buildings and land. Our goal is to produce beautiful, true-to-type Welsh Ponies and Cobs with excellent temperaments. We strive to provide wonderful first ponies for children, quality Welsh Mountain Ponies (Sec A), and Cobs (Sec. C and D). We believe that quality care assists in the production of quality ponies. 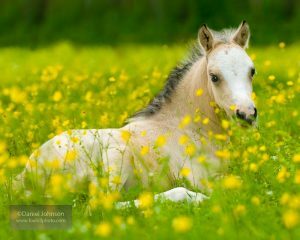 We strive very hard to provide the best start in life for our young stock and trained ponies. Each and every pony is stalled at night, and turned out on grass during the day. This ensures that the pony you purchase from us has had consistent handling and attention. In addition, each pony is on an individualized feeding program tailored to their own particular needs and condition. The ponies are on a regular de-worming program, are up-to-date on vaccinations, have their teeth attended to regularly, and our farrier visits the farm monthly for hoof trimmings and care. Our foals are handled from the first day, and halter training begins within the first week. By weaning, our foals are well-handled and used to interaction and attention. They have also had their feet trimmed from an early age to aid in the proper development of their legs and feet. We offer a few select ponies/cobs for sale each year. We are dedicated to providing quality ponies, whether their chosen purpose is as a child’s first pony, a hunter pony, a driving pony, or a future member of a breeding herd. To achieve this, we have carefully chosen our foundation stock, and our foals are proof of the quality of the bloodlines.